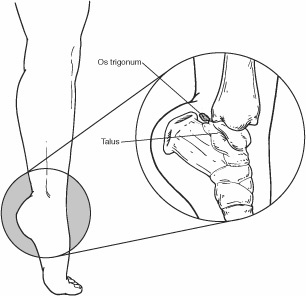 Os trigonum syndrome can mimic other conditions such as an Achilles tendon injury, ankle sprain, or talus fracture. Diagnosis of os trigonum syndrome begins with questions from the consultant about the development of the symptoms. After the foot and ankle are examined, x-rays or other imaging tests are often ordered to assist in making the diagnosis. A dressing is applied and the patients are instructed to remain touch weight bearing with crutches until their first post-operative visit at two weeks. A hard sole shoe or removable walking boot are used for another two weeks. At one month, the patients were allowed to resume activities as tolerated including return to sports.